I don’t necessarily advocate my technique over any other, but it is important to find a method that works for you and stick to it. Since I give my developing times for a number of films and developers on this site, I thought it appropriate that I explain the processing technique I use. I process my film for printing with a cold light source, and I use exactly the same technique every time. 1. Pre-soak - 1 minute, with agitation - in filtered water with two drops of Edwal LFN wetting agent per liter. LFN works much better than Kodak Photo-Flo in my experience. Some people have stated that pre-soaking is not necessary with modern films, but I’ve been doing it for so long I see no reason to change now (if it ain’t broke, don’t fix it). I used to presoak for 2 minutes or longer, but I read that testing has shown longer pre-soaks can cause variations in the required development time, but a one minute soak has no effect on development time. I have always added 30 seconds of extra development time that I do not record, on the theory that if the emulsion is swollen with water, it may take 30 seconds for the developer to begin working. 2. Develop - I mostly use the PMK pyro formula, occasionally the Pyrocat-HD formula. Rodinal is an old favorite, but I don’t use it that often anymore. I pour the developer into the can slowly and don’t start the clock until the lid is on the can. I pour the developer out 15 seconds before the time is up. 3. Agitate - I start with 30 seconds of continuous agitation, followed by ten sharp raps on the bottom of the developing can with my knuckles. For anything developed in PMK I agitate for 5 seconds (two inversions) every 30 seconds. With Rodinal and most other developers, I agitate for ten seconds (4 or 5 inversions) once per minute. I favor the torus method described by Ansel Adams in The Negative for roll film. Basically, you twist the developing can in a spiral movement as you invert it. I rap the can sharply on the bottom five times to dislodge air bubbles before setting it down. For sheet film I lift one end of the tray four or five times, working my way around the tray and lifting a different side every minute. 4. Water Bath - 15 seconds - I always use a bath of filtered tap water immediately after the developer. This effectively stops development and lowers the ph of the film so the stop bath doesn’t cause pinholes in the emulsion. 5. Stop Bath - 30 seconds - I have always used the formula Adams gives (1.5 ounces of 28% acetic acid and water to make 1 quart; or 45ml 28% acetic acid and water to make 1 liter). This is a 1.25% dilution. To dilute glacial acetic acid to 28%, combine 3 parts acid with 8 parts water, carefully. Wear acid-proof gloves and eye protection; work outside if possible and don’t breathe the fumes. Sometimes I use a water stop for PMK, instead of acid, in order to produce more stain--I use four changes of water, with vigorous agitation, taking about a minute. 6. Fix - 2 minutes, with continuous agitation - rapid fixer at film strength (1 part fixer, 3 parts water). For films with heavy dye layers like T-Max 100 I give 3 minutes with vigorous agitation. It is hard to overfix films, so it is better to err on the side of too much time than too little. 7. After Bath - I no longer use an after bath with staining developers. Tests have shown that in most circumstances they primarily add to base plus fog density. However, I have observed that a 2-3 minute soak in the used developer will help get the pink dye out of T-Max 100 film. 8. Wash Aid - 3 minutes - I use 10ml of Perma-Wash in 500ml of water, and agitate vigorously. With proper agitation, the wash aid will usually eliminate the red dye in T-Max films. 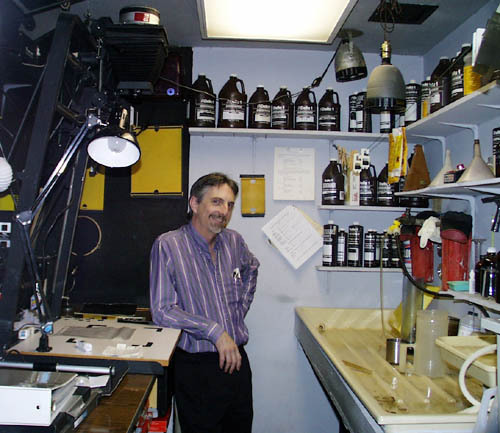 I never use Perma-Wash with photographic papers, but it is very effective for films. 9. Wash - 10 minutes - with a bubbling film washer, or (for sheet film) a tray siphon, with several complete changes of water. I usually dump the water out several times and reduce the wash time to 5 minutes, in an effort to save water and time. But as far as I know it is not possible to over-wash film. 10. Final Soak - 1 minute - distilled water with 1 drop of LFN per liter. I rap the bottom of the can to dislodge any bubbles in the reel, then let it sit for a short while. 11. Drying - I am fortunate to have a reasonably dust-free darkroom, so I just hang the film with a weight on the bottom for 4 to 6 hours. In areas where there is a great deal of dust, or the humidity is very low, it is necessary to have a special film drying cabinet that can be kept dust-free. A clothes bag can be converted into a film dryer.